Classes begin next week – or today? I had the best surprise today. As I was finishing up last minute administrative projects and preparing plans for my library classes, our transkinder (TK) class showed up, a week early, for their library class. They were so well-behaved. They sat down on the rug with their hands folded on their laps. Wow. Not bad for September! One of my favorite things to do with pre-k/TK classes is to sing. By a stroke of luck, I picked a “singing book” that I love called Five Little Ducks. It’s a book by Raffi, the famous singer of children’s songs. This happens to have been the book their teacher had been singing with them. So, together, we sang and made the hand motions that go with the book. It was a great start to their “trial run” library class. 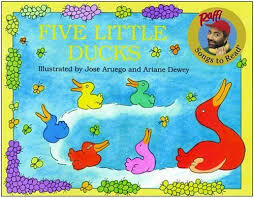 For those of you who don’t know the tune to Five Little Ducks, the music is in the back of the book. It’s simple and sweet. A great addition to any home library or pre-k/TK classroom. We moved on to one of my favorite preschool books, Ask Mr. Bear. Ask Mr. Bear is an old book, but kept them absolutely riveted as little Danny looks for a present for his mother’s birthday. The repetition, opportunity to practice animal sounds (much to the delight of my students who loved the goat’s “meh, meh” sound the best) and just the right amount of suspense. What a fun and satisfying read aloud. I was sorry to see them line up to go, but got such a nice feeling that this will be a great school year of classes. I haven’t written recently, because I’m waiting to make my recommendations to all my students based on my summer reading. I want to see which of my picks they really like, so stay tuned! I’m also very lucky to have a huge stack of new picture books to share with my students – so more news awaits as I read them to my classes. Hopefully we’ll find some books that I love, and they love too. I hope the beginning of the school year started as nicely for all of you.